Every album needs a slow and melancholic song inspired by cold, wet weather. And the fifth song to enter production for Dayglo Fishermen's new album appears to be that song. In possession of a chord sequence written by Sean on a suitably dark and grey January day, Peter set work in Mammoth Studios. Sean had recommended a tempo of 90 beats-per-minute but Peter was in a risk-taking mood, so he knocked it down to 80. While not as lethargic as the legendary song, Opium (which Peter worked on with Richard for the 'L'Amour De La Vie' album in the late 1980s), it was still slow enough to dampen the mood of even the most optimistic of creatures. Selecting a mellow octave-arpeggiated pad sound as the song's backbone, Peter quickly pieced together the song, adding Korg sampled textures to gently build some more density into the latter parts of the track. A simplified drum sequence was then added to prevent the mood slipping too far. But something was still missing. It was something 'real' - something acoustic sounding to cut through the layers of synthetic sound and add an organic dimension to the music. 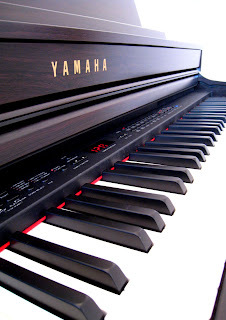 That 'something' was Mammoth Studios' new digital piano. The latest song was the ideal one to feature the new instrument's incredibly realistic sound. Using the piano sparingly, Peter added some gentle chords and melodies to the instrumental sections of the song, and then some sparse and deep notes to the other sections. With the song's backing music complete it now awaits its vocals.